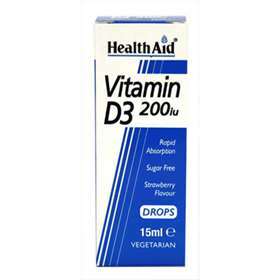 Health Aid Vitamin D3 drops is a natural food supplement which ensures your body has sufficient amounts of the essential vitamin. Vitamin D3 plays an essential role in maintaining and enhancing a strong immune system, it also plays a huge role in the regulation of absorption and utilisation of calcium and phosphorous . Children from birth to 1 year, one drop daily to be taken orally, or added to water or juice. Children from 1 to 12 years can increase up to two drops daily on the advice of a professional. Adults and children over 12 years, one to five drops daily. Xylitol, Water, Acacia gum, Soy lecithin, Cholecalciferol, Citric acid, Natural strawberry flavour, Potassium sorbate.